Last week, the New York Times City Room blog announced a writing contest open to the public. The challenge? 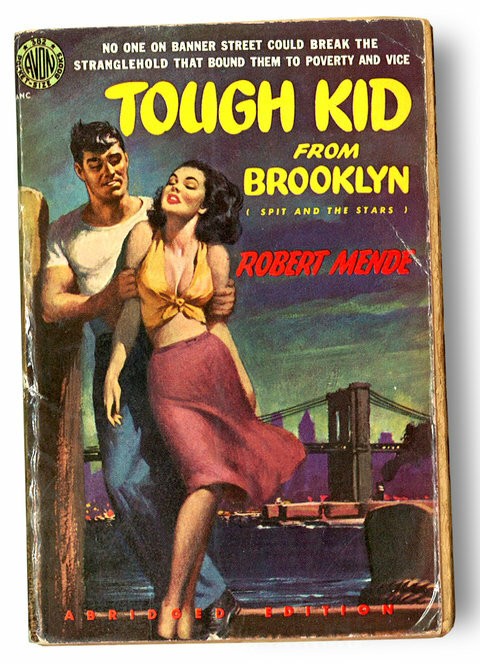 Come up with an original 150-word introduction to a pulp fiction novel based solely on the cover below. Here’s the link to the announcement. By the time the deadline had come and gone, over a thousand people responded, with some pretty damn good writing in evidence. Among the submissions was one by Gretchen Mahnkopf, a woman from Rosendale, New York. One thing Gretchen and I have in common is that back in the day, we both attended a hipster alternative school in the Adirondacks. Neither of us remember meeting each other there, although we must have, because it was a little school in the boondocks. But we’ve since connected–yes, through facebook–and I’ve come to admire her wit, her politics, and her artistic talent, because she’s a great painter and writer. Click here to visit Gretchen’s blog.